For other uses, see Jackhammer (disambiguation). (video) A construction worker uses a jackhammer in Japan. A jackhammer (pneumatic drill or demolition hammer in British English) is a pneumatic or electro-mechanical tool that combines a hammer directly with a chisel. It was invented by William Mcreavy, who then sold the patent to Charles Brady King. Hand-held jackhammers are generally powered by compressed air, but some are also powered by electric motors. Larger jackhammers, such as rig mounted hammers used on construction machinery, are usually hydraulically powered. They are typically used to break up rock, pavement, and concrete. A jackhammer operates by driving an internal hammer up and down. The hammer is first driven down to strike the back and then back up to return the hammer to the original position to repeat the cycle. The effectiveness of the jackhammer is dependent on how much force is applied to the tool. It is generally used like a hammer to break the hard surface or rock in construction works and it is not considered under earth moving equipment, along with its accessories (i.e., pusher leg, lubricator). In British English, electromechanical versions are colloquially known as "Kangos". The first steam-powered drill was patented by Samuel Miller in 1806. This drill used steam only for raising the drill. Pneumatic drills were developed in response to the needs of mining, quarrying, excavating, and tunneling. A pneumatic drill was proposed by a C. Brunton in 1844. In 1846 a percussion drill that could be worked by steam or atmospheric pressure obtained from a vacuum was patented in Britain by Thomas Clarke, Mark Freeman and John Varley. The first American "percussion drill" was made in 1848 and patented in 1849 by Jonathan J. Couch of Philadelphia, Pennsylvania. In this drill, the drill bit passed through the piston of a steam engine. The piston snagged the drill bit and hurled it against the rock face. It was an experimental model. In 1849, Couch's assistant, Joseph W. Fowle, filed a patent caveat for a percussion drill of his own design. In Fowle’s drill, the drill bit was connected directly to the piston in the steam cylinder; specifically, the drill bit was connected to the piston’s crosshead. The drill also had a mechanism for turning the drill bit around its axis between strokes and for advancing the drill as the hole deepened. By 1850 or 1851, Fowle was using compressed air to drive his drill, making it the first true pneumatic drill. The demand for pneumatic drills was driven especially by miners and tunnelers, because steam engines needed fires to operate and the ventilation in mines and tunnels was inadequate to vent the fires' fumes; there was also no way to convey steam over long distances, e.g., from the surface to the bottom of a mine; and mines and tunnels occasionally contained flammable explosive gases such as methane. By contrast, compressed air could be conveyed over long distances without loss of its energy, and after the compressed air had been used to power equipment, it could ventilate a mine or tunnel. In Europe since the late 1840s, the king of Sardinia, Carlo Alberto, had been contemplating the excavation of a 12-kilometer (7.5 mi) tunnel through Mount Fréjus to create a rail link between Italy and France, which would cross his realm. The need for a mechanical rock drill was obvious and this sparked research on pneumatic rock drills in Europe. A Frenchman, Cavé, designed, and in 1851 patented, a rock drill that used compressed air; but the air had to be admitted manually to the cylinder during each stroke, so it was not successful. In 1854, in England, Thomas Bartlett made and then patented (1855) a rock drill whose drill bit was connected directly to the piston of a steam engine. In 1855 Bartlett demonstrated his drill, powered by compressed air, to officials of the Mount Fréjus tunnel project. (In 1855, a German, Schumann, invented a similar pneumatic rock drill in Freiburg, Germany.) Bartlett’s drill was refined by the Savoy-born engineer Germain Sommeiller (1815-1871) and his colleagues, Grandis and Grattoni, by 1861. Thereafter, many inventors refined the pneumatic drill. Sommeiller took his drill to the lengthy Gotthard Pass Tunnel then being built to link railways between Switzerland and Italy under the Alps. Atlas Copco and Ingersoll Rand were two important drill companies in Europe and America respectively, each holding patents and dominating the industry. From this mining and railway tunnelling expanded. The word "jackhammer" is used in North American English and Australia, while "pneumatic drill" is used colloquially elsewhere in the English speaking world, although strictly speaking a "pneumatic drill" refers to a pneumatically driven jackhammer. In Britain, electromechanical versions are colloquially known as "Kangos". The term comes from the former British brand name now owned by Milwaukee tools. A full-sized portable jackhammer is impractical for use against walls and steep slopes, except by a very strong person, as the user would have to both support the weight of the tool, and push the tool back against the work after each blow. A technique developed by experienced workers is a two-man team to overcome this obstacle of gravity: one operates the hammer and the second assists by holding the hammer either on his shoulders or cradled in his arms. Both use their combined weight to push the bit into the workface. This method is commonly referred to as horizontal jackhammering. Another method is overhead jackhammering, requiring strength conditioning and endurance to hold a smaller jackhammer, called a rivet buster, over one's head. To make overhead work safer a platform can be used. One such platform is a P.A.M. (Positioner Actuator Manipulator). This unit takes all the weight and vibration from the user. A compressor for running a pneumatic jackhammer. Additionally, some users of pneumatic jackhammers may use a pneumatic lubricator which is placed in series with the air hose powering the air hammer. This increases the life and performance of the jackhammer. Specific lubricant is filled in the pneumatic lubricator. Furthermore, air compressors typically incorporate moisture into the compressed air leading to freeze-ups of the jackhammer or air hammer in cold weather. A single phase demolition breaker. An electropneumatic hammer is often called a "rotary hammer," because it has an electric motor, which rotates a crank. The hammer has two pistons—a drive piston and a free flight piston. The crank moves the drive piston back and forth in the same cylinder as the flight piston. The drive piston never touches the flight piston. Instead the drive piston compresses air in the cylinder, which then propels the flight piston against a striker, which contacts the drill bit. Electric powered tools come in a variety of sizes from about 12 lbs - 65 lbs. They require an external power source, but do not require a compressor. Although in the past these tools did not have the power of an air or pneumatic hammer, this is changing with newer brushless-motor tools coming close to the power of a pneumatic tool and in some cases even matching it. Electric powered tools are useful for locations where access to a compressor is limited or impractical, such as inside a building, in a crowded construction site, or in a remote location and it is not come under earth moving equipment or tool. Electropneumatic tools use a variety of chucks for attaching chisels, but the most common are SDS-max, 7/8" Hex, TE-S, and 1-1/8" Hex. The connection end size is also related to the breaking energy of the tool. For example, the Bosch and Hilti 12 lb tools both use SDS-max, while the Bosch, Hilti, and Makita 65 lbs tools all use 1-1/8" Hex connection. 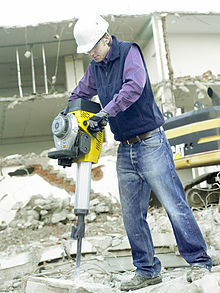 See hammer drills for more on electropneumatic hammering. An excavator-mounted hydraulic jackhammer being used to break up concrete. A hydraulic jackhammer, generally much larger than portable ones, may be fitted to mechanical excavators or backhoes and is widely used for roadwork, quarrying and general demolition or construction groundwork. These larger machine mounted breakers are known as Rig Mounted, or Machine Mounted Breakers. Such tools can also be used against vertical walls (or ceilings for that matter), since the vehicles involved are massive enough and powerful enough to exert the forces involved without needing the help of gravity in operating the tool. Pneumatic or hydraulic tools are particularly likely to be used in mines where there is an explosion risk (such as underground coal mines), since they lack any high-power electrical circuitry that might cause a triggering spark. Advances in technology have allowed for portable hydraulic breakers. The jackhammer is connected with hydraulic hoses to a portable hydraulic powerpack: either a petrol or diesel engine driving a hydraulic pump; or a mini-excavator or skid-steer via a power take-off driveshaft to the machine's hydraulic system. Hydraulic power sources are more efficient than air compressors, making the kit smaller, cheaper or more powerful than a comparable pneumatic version. Spade — provides flat finish for concrete or edging in asphalt or dirt. Chisels may be resharpened in a shop or with an angle grinder with grinding disc. After resharpening, they must then be heat treated to restore the integrity of the steel before use. As an alternative, Hilti also manufacturers self-sharpening polygon and flat chisels in SDS-max, TE-S, and 1-1/8" Hex connection ends. The sound of the hammer blows, combined with the explosive air exhaust, makes pneumatic jackhammers dangerously loud, emitting 100 decibels at two meters. Sound-blocking earmuffs must be worn by the operator to prevent a form of hearing damage, of which tinnitus is the main symptom. Most pneumatic jackhammers now have a silencer around the barrel of the tool. Use has been linked to Raynaud syndrome. Prolonged exposure to the pronounced vibration conducted by the tool can lead to blood-circulation failures in the fingers, a condition known as vibration white finger. Applying athletic tape is not very effective in preventing white finger but seems to help alleviate some of its discomfort. Pneumatic drill usage can also lead to a predisposition for development of carpal tunnel syndrome. Some manufacturers of electro-pneumatic tools now offer vibration reduction systems to reduce the vibration felt by the operator. For example, the Hilti TE 3000-AVR has approximately the same impact energy of a 60 lb pneumatic hammer, but the vibration felt by the operator is significantly less (7 m/s2). Other manufacturers such as Makita, DeWalt and Bosch also offer electric tools with vibration dampening. Using a jackhammer to break up concrete pavement may expose the operator to hazardous dust containing respirable crystalline silica (RCS). ^ Brunton, C. (1844 September 21) "Design of wind hammer for boring rocks," The Mechanics' Magazine, 41 : 203–204. ^ West, Graham, Innovation and the Rise of the Tunnelling Industry (Cambridge, England: Cambridge University Press, 1988), p. 33. ^ Henry S. Drinker,Tunneling, explosive compounds, and rock drills … (New York, New York: John Wiley & Sons, 1878), pages 153-157. ^ Drinker (1878), page 160. ^ Drinker (1878), page 164. ^ Drinker (1878), page 266. ^ The project was called the "Mount Cenis tunnel" although the tunnel passed under Mount Fréjus. ^ Drinker (1878), page 152. ^ Drinker (1878), pages 168 and 266. ^ Drinker (1878), pages 151-152. ^ Drinker (1878), pages 169 and 266. ^ See: Drinker (1878), page 168. See also: page 2 of Eustace M. Weston, Rock drills: design, construction and use (New York, New York: McGraw-Hill, 1910). ^ Ellis, Iain (7 September 2006). Ellis' British Railway Engineering Encyclopaedia. lulu.com. p. 371. ISBN 9781847286437. Retrieved 17 February 2014. ^ Clint DeBoer. "How's It Work? Rotary Hammers". Pro Tool Reviews. Retrieved June 22, 2016. ^ "Workplace Safety & Health Topics: Silica: Jackhammer". Centers for Disease Control and Prevention. 29 July 2013. Retrieved 20 December 2014. Publication date is date of last page update. Wikimedia Commons has media related to Jackhammers.